The Kuala Lumpur Bar traces its roots to the Selangor Bar Association which was established in 1903. Prior to 1896, any legal cases regardless whether with large importance or complexity had to be commenced and carried out without legal assistance of any kind. It was left to the management of the litigants themselves. This was due to a Circular by the Acting Resident of Selangor (Circular 17.5.1892) in which he declared that “the settled policy of the Government of the Protected Native States (i.e. the Federated Malay States) not to admit lawyers to practise in the States”. Thus, litigants had to conduct their own cases in the courts. Notwithstanding the restriction by the Acting Resident of Selangor, records show that locals had appeared as counsels for litigants. In Raja Bot v Ah Chan (1889), one Raja Bot acted as an attorney for Abdul Kadir of Lukut to recover the sum of $1000 owed to Haji Yahya, the deceased father of Abdul Kadir. The Magistrate held that the Defendant, a mining towkay, had admitted the debt and the debt was not barred by laws of limitation. However, the restriction had caused considerable problem to investors in the Federated Malay States. The Magistrate Court Judges took very brief notes and their grounds of judgement were also brief and without much discussions of law and facts. To protect their rights and capital invested in the state of Selangor, the Selangor Planters’ Association made an appeal to the Government to admit a limited number of lawyers of position and standing to practise in the Courts of Selangor. The Association complained of the utter stagnation in the Selangor Court and the enormous accumulation of arrears. 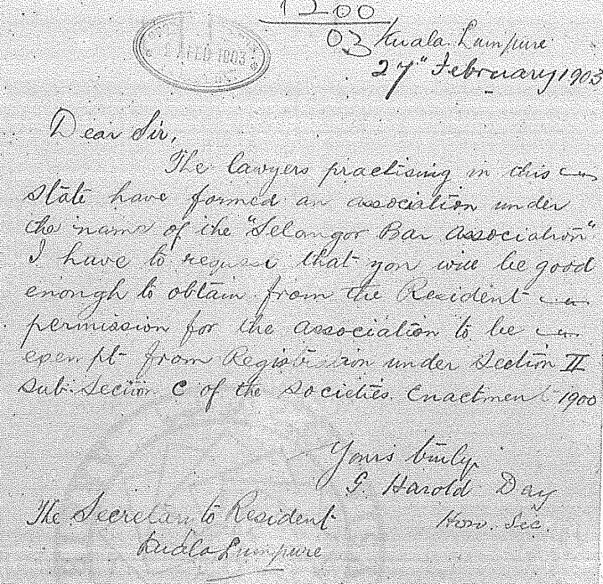 In a letter dated 2 December 1896 to the Government Secretary, the Selangor Planters’ Association stated that they had resolved that “Government be urged to throw open the Magistrates courts of the Federated States to legal practitioners of status and position, the large vested interests of capitalists deserving in the opinion of this Association, more adequate protection than that afforded at present”. The establishment of the Judicial Commissioner’s Court in 1896 paved the way for lawyers, who were already practising in other states such as Singapore and Penang, to practise in the Federated Malay States (“FMS”). Their right, however, was not extended to the lower Courts thus in 1897, John Parsick Joaquim, C W Hewgill and Vernon Francis Page (also known as V F Page — a lawyer who practised in Bangkok) mounted a challenge to have the right to appear in the criminal Lower Courts. The then-Judicial Commissioner, Lawrence Colville Jackson (L C Jackson) granted John Parsick Joaquim’s application to have the right to appear at the criminal Lower Courts. Soon, the lawyers were also granted the right to appear at the civil Lower Courts. In 1903, lawyers practising in the state of Selangor formed the “Selangor Bar Association” with C W Hewgill and G Harold Day as their first President and Honorary Secretary, respectively. C W Hewgill was called to the Straits Settlement Bar in Singapore in 1893 before moving to Kuala Lumpur to set up his practice in 1896. He had the honour of being the first advocate in private practice to appear at the Judicial Commissioner’s Court. The Judicial Commissioner’s Court was the final Court of Appeal for the Federated Malay States during that time and was later replaced by the Supreme Court in 1905. C W Hewgill later established the firm of Hewgill and Day with G Harold Day until it was amalgamated with the firm of Messrs Bannon and Bailey in March 1917, . Hewgill died some time in the early 1930s. The early members of Selangor Bar Association were active in the social and legal arena. Records indicate that the members were actively engaging the then-Government on matters concerning legal practice such as opposing to new rules allowing civil servants to be admitted to the local Bar, suggesting that posts of Senior Magistrates should be confined to “barristers, advocates and solicitors who had carried on their profession for at least five years at the time of appointment” and extending time to file appeal from seven days to 21 days. On 21 February 1925, a meeting was held by a group of advocates and solicitors practising in Selangor and from the meeting, it was resolved that an association, also called the “Selangor Bar Association” be formed. The Office Bearers were T H T Rogers, B J P Joaquim, A S Bailey, Vivien Mackie and William George Warren Hastings. It is unknown from the records why these advocates and solicitors had formed the “Selangor Bar Association” as it had already been in existence since 1903. 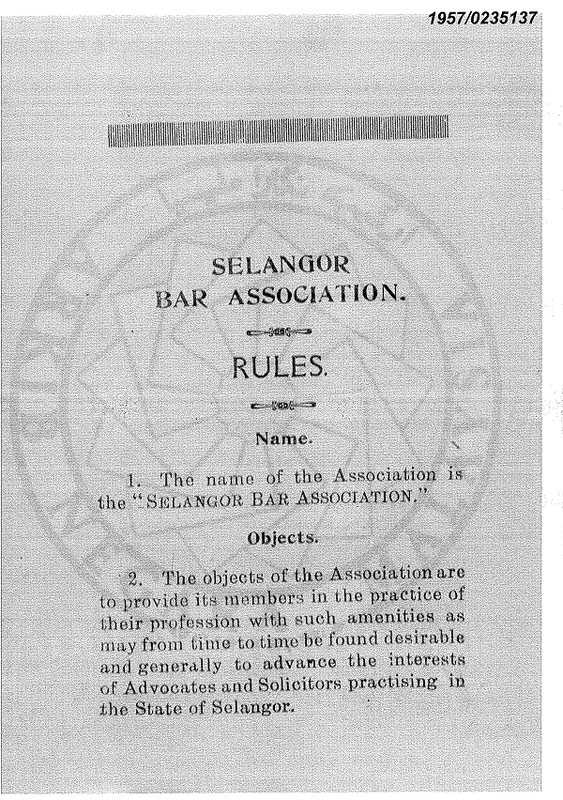 According to the Rules of the Association of the Selangor Bar Association, the objects of the Association are to “provide its members in the practice of their profession with such amenities as may from time to time be found desirable, and generally to advance the interest of Advocates and Solicitors practising in the State of Selangor”. The premises of the Association were “room or rooms in the Supreme Court of Kuala Lumpur”. The “entrance fee” for ordinary members was $15 and subscription was fixed $2 per mensem (per month), payable half-yearly in advance. An ordinary general meeting of the Association was held every year in the month of January and only three ordinary members were sufficient to form a quorum. 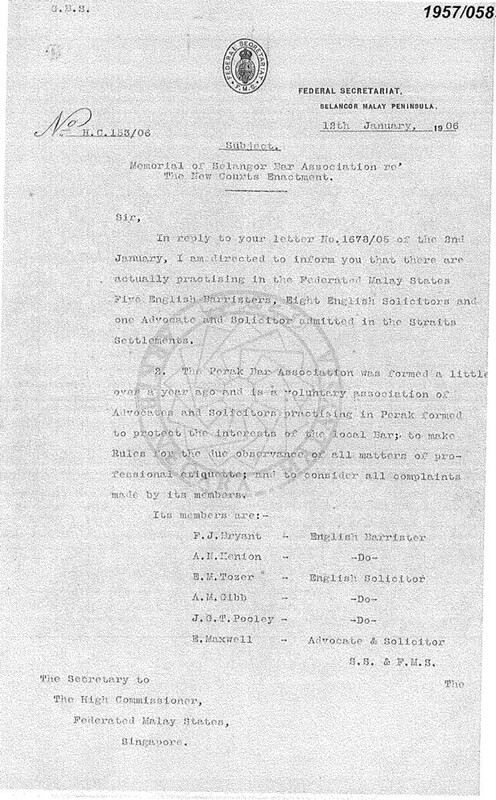 This new Selangor Bar Association was also exempted by the Selangor British Resident from registration under the Societies Enactment 1913. It is unfortunate that the records of the early years of the early Selangor Bar Association and Selangor Bar Committee are lost. The earliest record held by the Kuala Lumpur Bar is 1956 where the late R R Ramani was the Chairman together with four other committee members namely M N Cumarasami, S M Yong (who later became a Judge) and N A Marjoribanks. The Advocates and Solicitors Ordinance 1947 (“1947 Ordinance”) only allows four committee members in the local State Bar. The complete rolls of Chairman and Committee members before 1947 were also no longer available. However, based on the newspaper reports and records of the National Archives, the Office Bearers of the Selangor Bar Association of 1925 were T H T Rogers, B J P Joaquim, A S Bailey, Vivien Mackie and W G W Hasting. In 1934, W G W Hastings, K K Benjamin and A K Sen were elected as members whereas S M Yong was appointed as Honorary Secretary. B J P Joaquim, T Rajendra and J T Toswill were elected members of the Committee and P C Au-Young as Honorary Secretary in 1937. The numbers grew slowly. In 1906, there were only six members (three English Barristers and four English Solicitors) in the Selangor Bar Association. The six members were C Wagner, G Harold Day, H N Ferrers, C W Hewgill, J H T Rogers, C H Downes and M R Thornton — all with offices at Klyne Street (now Jalan Hang Lekiu), Kuala Lumpur. 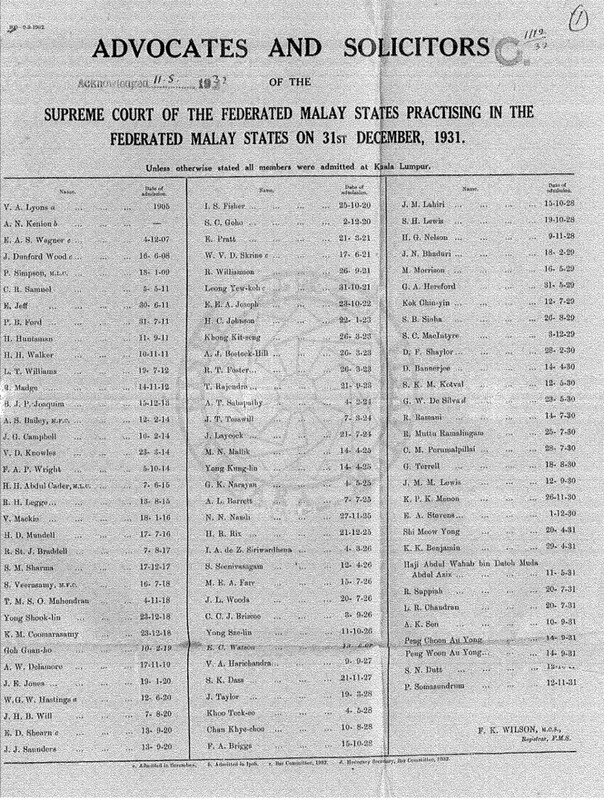 In 1969, there were 238 members practising in Selangor (Selangor Bar Annual Report, 25 January 1969). The rolls of the FMS Court show that Hoosein Hasannly Abdul Cader (also known as H H Abdoolcader) was the first Asian (and also Indian) name appearing on the rolls (admitted in 1915). However, H H Abdul Cader (later Sir) practised mainly in Penang. Raja Musa b Raja Haji Bot was the first Malay to be called to the FMS Bar in 1929 and also the English Bar. He later became the first Malay to sit on the Bench of the Supreme Court of the FMS and had subsequently been appointed Professor of Law at Raffles College. During the Japanese Occupation, he was appointed a Judge of the Supreme Court, Singapore. He passed away in 1943. The first Chinese lawyer called to the FMS Bar was Yong Shook Lin (admitted 1918), who later found Messrs Shook Lin & Bok together with Tan Teow Bok. Upon the advent of the 1947 Ordinance, the Selangor Bar Committee was established. The 1947 Ordinance requires every annual meeting of the local bars be presided by the most senior member present. The practice has now been abolished by the Legal Profession Act 1976. In 1956, M N Cumarasami (admitted to FMS Bar in 1929) presided the annual meeting of the Selangor Bar as he was the most senior member present. In 1956, the subscription fee for Selangor Bar was $2.50 per month. In 1970, it was $30 per annum. Such subscription fee was not mandatory and members were able to practise without payment of such fee in those days. The Bar Committee was tasked to collect outstanding payments from time to time. Under the 1947 Ordinance, local State Bars were empowered with disciplinary functions. Committee members will deliberate on complaints against fellow members and if there is a cause for complaint, the local Bar will refer the matter to the Chief Justice who will then establish a Disciplinary Committee. In 1970, there were 23 complaints against members, of which five were referred to the Chief Justice under the appropriate provisions of the 1947 Ordinance. The Committee considered 16 complaints did not merit any reference to the Chief Justice. complaint by a Judge against a member over his conduct in Court. In 1947, the Selangor Bar Committee changed its name to Selangor and Negri Sembilan Bar Committee and then to Selangor, Negri Sembilan and Kelantan Bar Committee in 1949. 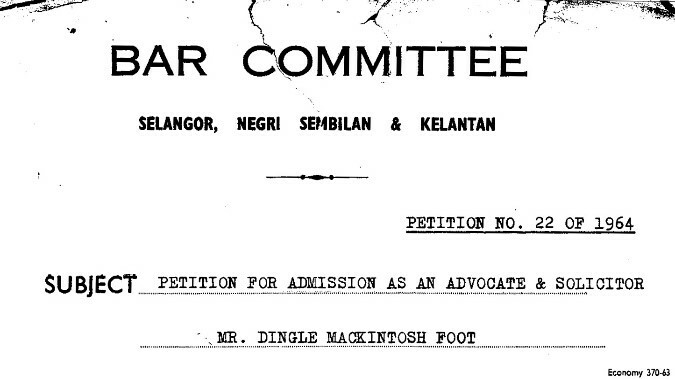 In 1964, the Negri Sembilan Bar Committee was established with Dato’ Balwant Singh as its first chairman. P S Maniam was elected as the honorary secretary and V C George, H W Tan, Atma Singh Gill and Edgar Joseph Jnr were elected as committee members. With the establishment of the Negri Sembilan Bar Committee, the name was changed to Selangor and Kelantan Bar Committee. In 1965, the name was reverted back to its original name after Kelantan Bar Committee was established. Kuala Lumpur was made a Federal Territory on 1 February 1974. When the Legal Profession Act 1976 came into force in 1976, it was provided for under section 68(3) that all lawyers practising within the Federal Territory were deemed to be members of the Selangor State Bar. Upon the establishment of the Federal Territory of Kuala Lumpur, the Selangor Bar Committee was renamed the Selangor and Federal Territory Bar Committee in 1979. In the 1986 Annual General Meeting of the Federal Territory and Selangor Bar, it was mooted whether a separate Bar be established for all practising members within the state of Selangor. Members practising in the state of Selangor felt that they will be better served with a committee that comprises more Selangor Bar members and furthermore, most Bar events were held in Kuala Lumpur. However, this discussion was abandoned and the floor decided that the incoming Committee appoint two protem Committee to study the severance of the Federal Territory and Selangor Bar. The Selangor Bar Protem Committee and Federal Territory Bar Protem Committee were then established and chaired by Jeffrey Fernandez and Dulip Singh, respectively. Written opinions were provided by Mohd Ismail Shariff and Anthony Rocky Fernandez on whether the then-Legal Profession Act 1976 allows the severance of the Selangor and Federal Territory Bar. 68(4) Members practising in the Federal Territory shall be at a general meeting called for the purpose by a majority vote of the members present be entitled to establish a separate Bar for the Federal Territory and until such time they shall be deemed to be members of the Selangor State Bar. The said amendment was then forwarded to the Attorney General and in 1992, section 68(4) was introduced to allow the establishment of the Kuala Lumpur Bar. The words “Kuala Lumpur” were added. Section 68(4) is the only provision in the Legal Profession Act 1976 that specifically mentions a State Bar. A meeting of members practising in the Federal Territory of Kuala Lumpur was called in 1992. About 2,300 members were practising in Kuala Lumpur at that time. The Selangor Bar also called a meeting to fill the vacancies left by committee members who ceased to be members of the Selangor Bar. On 1 July 1992, the Kuala Lumpur Bar Committee was established. R R Sethu was the first Chairman of the Kuala Lumpur Bar Committee and he held this position for the next three terms. Saseedharan Menon was the first Honorary Secretary of the Kuala Lumpur Bar Committee. Other committee members were Hendon Mohamed, Roy Rajasingham, M Puravalen, Manjeet Singh and Zainudin b Haji Ismail. Lee Swee Seng and Mah Weng Kwai (both later became judges) were the first co-opt committee members of the Kuala Lumpur Bar. According to the Bar Council’s Legal Directory (as at 20 July 1992), Low Chi Cheng, Tan Sheh Lynn, Seet Hooi Ping and Loke Dore Lee were the first newly admitted members of the Kuala Lumpur Bar. They were admitted to the Malaysian Bar on 10 July 1992 — nine days after the establishment of the Kuala Lumpur Bar. Messrs Bannon and Bailey was founded by Raymond B Bannon and Arnold Savage Bailey in 1913. Savage Bailey later became a Judge in the Johor Supreme Court but tragically died after he fell off from a ship in 1935. The firm was dissolved in April 1963 and this led to the establishment of Messrs Skrine and Co by its former partners, John S H Skrine, S D K Peddie and Peter Mooney in the same year. It is noted that John S H Skrine’s father, Walter Vivian Douglas Skrine (W V D Skrine) was a partner of Messrs Bannon and Bailey. The former Chief Justice of Singapore, Chan Sek Keong chambered in Messrs Bannon and Bailey in 1962. Also known as W G W Hastings. He established Lovelace & Hastings in 1913. Hastings was a temporary Judge of the Federated Malay States Supreme Court and Federal Councillor. He died in 1952. M N Cumarasami was called to the Federated Malay States Bar in 1929 and passed away in 1962. The then-Prime Minister, the late Tunku Abdul Rahman moved a tribute to him in Parliament as he was an old member of the House. (Hansard 20 January 1962, Vol III, No 33).